Maersk Tankers has completed a landmark delivery to one of its vessels using a drone. Denmark is famous for its cookies – and the lucky crew of the Maersk Edgar received a tin of biscuits by air in this groundbreaking trial. The test drone, LE 4-8X Dual Atex, is from French company Xamen and is ATEX zone 2 approved for use in potentially explosive environments. It is an octocopter drone with a wingspan of 104 cm and 40 cm height and 16 m per second maximum speed. “Drones could cut time and costs for deliveries and inspections across the Maersk Group – but they must be reliable and absolutely safe,” the company said in a release. “There are high costs for onboard delivery of small parcels, filled with urgent spare parts or mail, because of the need for a barge,” said Markus Kuhn, supply chain manager at Maersk Tankers. Costs for a barge are on average $1,000 and can be higher. That means, drone use could with the current payload bring potential savings of $3,000 to $9,000 per vessel per year, Maersk Tankers estimates. Drones are being tested for inspections across the Maersk Group. Maersk Oil is using them for installations in the North Sea and APM Terminals for cranes in its ports. Other potential uses as drone technology are developing rapidly. They could carry out inspections or piracy look-out in high-risk transits. Inspections could include high quality photos or videos of certain areas, such as the transom stern and flare on the bow, or cargo tanks. 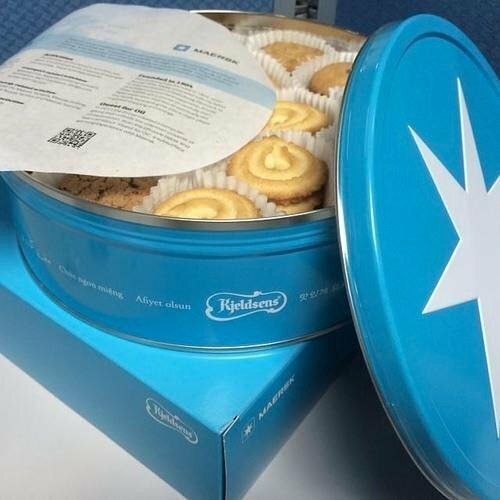 Maersk for many years has had its own branded cookies (pictured below) made by Danish firm Kjeldsens. How far did the drone travel to make the delivery? Soon seaman will be dropped by the drones…no gangway needed.